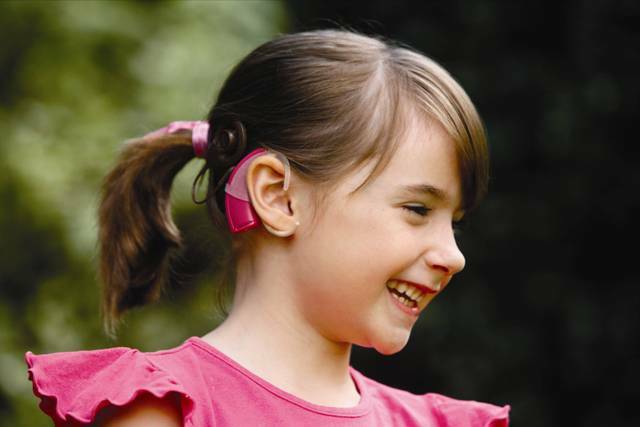 Nearly 30,000 children in the United States have cochlear implants (CI). The device, which consists of a surgically implanted receiver and an external microphone and transmitter, restores hearing to children that have profound hearing loss or deafness. The quality of sound is different from natural hearing because less sound information is being received and processed by the brain, but for many children, the cochlear implant is nothing short of a medical miracle, restoring the ability to hear and understand speech and environmental sounds. What does life sound like for a child with a CI? "I'll try to make a visual picture that relates to the way sound is heard by a child with a cochlear implant. Suppose that you have to identify a four-legged animal, and you've not seen that animal before but you have to figure out what it is. Maybe you have to draw it. Maybe you have to learn the name for it. Now, that animal is standing behind a bunch of trees. To see that animal, you have to look through tree trunks that are hiding big parts of that animal. Now, if you were looking through those trees with the equivalent of a hearing aid, you could probably only see the tail end of that animal, because you could only hear the low frequencies with that hearing aid. With a cochlear implant, though, you could see pieces of that animals head, pieces of its neck, its legs, its body, and pieces of its tail end, but you still would be missing pieces in between each of those that you could see. The reason Im bringing this up for you to think about is because its important for us to realize that children who are using cochlear implants still don't see the whole animal. They see more of a range of that animal, but they have to use their brains. They have to use what they already know about the world. They have to use their cognitive abilities to fill in those gaps to be able to put together a picture of that whole animal. Thats the kind of task that a child is facing using a cochlear implant." How do Cochlear Implants Affect Playground Design? When we design playgrounds that are meant to be inclusive, meaning they are accessible by, and provide play value for, children of all abilities, we encourage customers to consider children who have cochlear implants. Play activities that provide rich visual stimulation are a good idea, as they provide the same level of play value for children of all hearing levels. There are also sound and auditory activities that will work well with most CIs. Sound panels that mimic real life animal or instrument sounds will sound different through a CI, but they will provide a distinguishable auditory experience from the rest of the noise on the playground. One of the most important aspects of designing a playground for children with a CI is the use of plastic slides. When a child slides down a plastic slide, static electricity is generated along the surface. The amount of static electricity depends on several factors including, weather conditions, type of clothing worn, etc. When the static electricity builds up there is an Electrostatic Discharge (ESD) that can, in rare cases, affect the external transmitter of a CI. There is no harm to the child or the internal implant, but the CI will stop working until an audiologist can recalibrate the device. This means the rest of the play experience will be in silence, depriving the child of some of the benefits of play. Throughout our research of plastic slides and static electricity, there was one material in the study that resulted in zero ESD - stainless steel. Stainless steel is not susceptible to a transfer of a charge between different materials. Slides constructed of stainless steel have been around for decades but fell out of vogue as the brightly colored, molded plastic slides appeared in the marketplace. The benefits of sliding, however, are essentially the same on a stainless steel slide as they are on a plastic slide. Both provide vestibular stimulation, which means that it stimulates the ear canal and the fluids in it, helping to develop a sense of balance. Sliding helps children to learn to keep their torsos straight to maintain balance, improves core strength and enhances decision-making abilities. The advantage stainless steel has over plastic is children with CIs can realize all of these play benefits without risking an ESD that "shorts out" the electronics of the external transmitter. 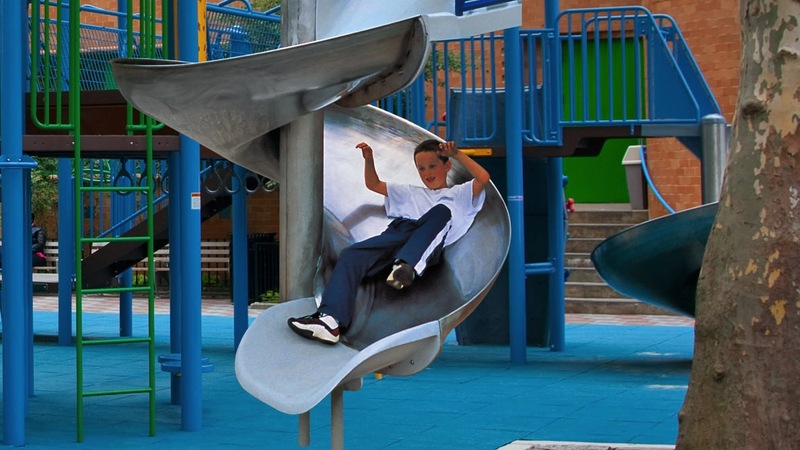 Moreover, stainless steel slides are extremely durable and withstand the rigors of play over a longer period of time than their plastic counterparts. We manufacture stainless steel slides at various deck heights. We build stainless slides in single, double and spiral configurations. We even offer stainless steel slides that can be freestanding, attached to a play system or installed as a hillside slide. With so many options, you have the flexibility to design a play environment with steel slides, plastic slides or both. This allows communities to build a play space that is truly inclusive for children of all abilities. To learn more about GameTime's commitment to inclusive play, visit www.gametime.com/inclusive or call 800-235-2440 to speak with a GameTime representative in your neighborhood about design options.